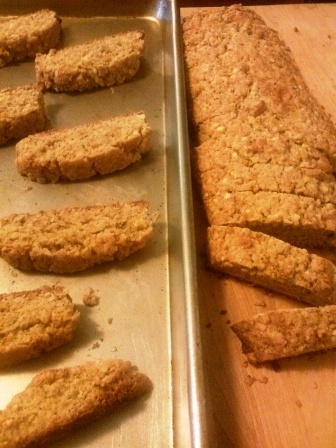 It’s not actually biscotti that are the sincerest form of flattery, it’s imitation. These cookies imitate Black Pepper-Walnut Biscotti that I ate at Enrico Biscotti Company in Pittsburgh. I do mean imitate here, because after all the tweaking to make them the way I wanted, they don’t really taste much like the original. Except for the black pepper part. While futzing about with this biscotti project, I heard a Taste Matters podcast with David Sax, author of the recent book Tastemakers about what makes food trends take off. Sax mentioned just how quickly chefs around the world rip each other off when someone has a new, popular recipe. If each person adds their own twist, then you’ll soon end up with a dynamic new “thing”. These cookies may not be the wildly popular cronut (doughnut / croissant hybrid. . . interestingly, last night I had a dream about a cinnamon bun / monkey bread hyrbrid – next great thing?). Still, I like to think I’m doing my part to promote the not-yet-existent spicy biscotti trend. Pulverize the almonds in a food processor until they’re almost to flour stage, with a few chunky bits left for texture. Dump them into a large bowl. Add the rest of the dry ingredients to the food processor, whirl until they’re all mixed. Cut up butter, add to dry ingredients, process again until it’s fully cut in. Add into bowl with almonds, mix together then make a well in the middle. In the well in the dry ingredients, add eggs & olive oil and whisk with a fork until well blended. Then work your way out mixing it into the rest of the ingredients. It should just be damp enough to hold together, if it’s not quite there add a few splashes of milk. Form into two logs, about 4″ wide, on a baking sheet. Bake until just cooked all the way through – about 20-25 minutes. Remove from oven, turn it down to 325. Let cool until cool enough to handle. With a bread knife, cut logs into cookies about 1″ wide. Return to baking sheets (you’ll need 2 now). Bake at 325 until they’re the amount of dry you want – 25-30 minutes, I’d say. Put on cooling racks and let cool completely before eating.